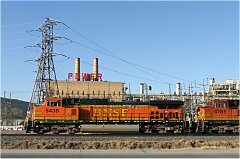 El Paso, TX - "Railfan Primer"
BNSF and UP in El Paso. October 2001. Located in the farthest reaches of west Texas along the Mexican border, the city of El Paso remains largely unexplored by most railroad enthusiasts. 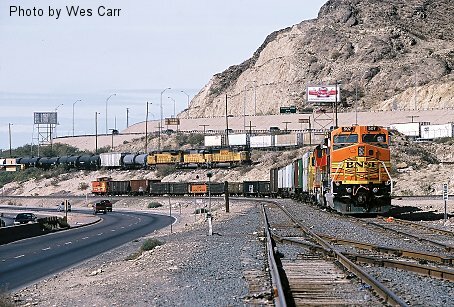 El Paso is home to Union Pacific lines extending in three directions (west toward Tucson, AZ; north toward Tucumcari, NM and Dalhart, TX; and east toward Sierra Blanca, where lines to San Antonio and Fort Worth diverge), a BNSF line extending north to Belen, NM, and a connection with Mexico. Amtrak's Sunset Limited passes through town three times weekly in each direction on the former Southern Pacific "Sunset Route" between Los Angeles and New Orleans. For the railfan, El Paso offers numerous locations to observe and photograph rail operations, most notably in the downtown area and northwest of downtown. The region's dry, desert climate and rocky hillsides along the Rio Grande add extra photographic appeal. A few locations provide a view of both the BNSF and UP lines, with the city of Ciudad Juarez, Mexico located across the Rio Grande as a backdrop. And perhaps best of all are the UP's two massive bridges over the Rio Grande, at the point where the Rio Grande marks the Texas-New Mexico state line just north of the international border. Click here to see a map of El Paso. BNSF's El Paso Subdivision heads due north from El Paso, passing through Las Cruces, NM on its way to Belen. Traffic consists of a daily manifest freight in each direction, approximately one grain train in each direction daily (loads south, empties north), occasional auto rack trains, and frequent locals and switch jobs. The El Paso Sub is unsignalled TWC (track warrant control), and it's fairly easy to keep tabs on traffic simply by monitoring the radio. BNSF's small yard in El Paso parallels the Rio Grande west of the downtown area. Most of the yard is not publicly accessible, but a good view of the El Paso Freight House, at the bottom end of the yard, is available from South Santa Fe Street. NOTE: Timetable direction on this line is east-west. Trains headed south toward El Paso are "westbounds" per timetable direction; trains headed north, away from El Paso, are considered eastbounds. 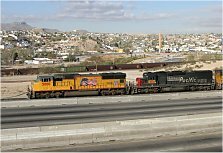 A few additional notes about railfanning in El Paso: due to the city's proximity to the international border, the railroad companies are highly vigilant in protecting their property from trespassers. Trespassing on railroad property to watch trains or take photos is strongly discouraged. Additionally, the US Border Patrol maintains a very noticable presence along the Rio Grande through the city, and their agents may question you if they see you taking photographs near locations where they are stationed. I have always felt relatively safe taking photographs in the city itself, but if you venture out west of town along the UP Lordsburg Sub between El Paso and Santa Teresa (Anapra, Lizard), PROCEED AT YOUR OWN RISK. These locations are reportedly very busy travel routes for illegal immigrants, and I've heard and read numerous reports of criminal activity taking place in these areas. Enjoy your visit, but be very aware of your surroundings, and be prepared to leave a location on short notice if something doesn't seem or feel "right"". Thanks to Ernie Leggett for providing information on El Paso radio frequencies.